Martial Arts is a systemic practice of combat often used in military, law enforcement and self-defense. In American culture one of the most widely used tools for armed combat is firearms. Therefore, shooting for personal defense must be categorized as Martial Arts. TAC-1's philosophy is to train technique, develop knowledge and derive higher personal image to survive violent encounters. TAC-1's training foundation can be found in its Combat Triad which includes all three areas as it's pillar of combat doctrine. TAC-1 Student Ranking is based upon the student's performance in Pistol-II(D) (Examination and Certification) shooting course. Students are classified as Marksman, Sharpshooter, Expert or Master depending on the final score of the test. 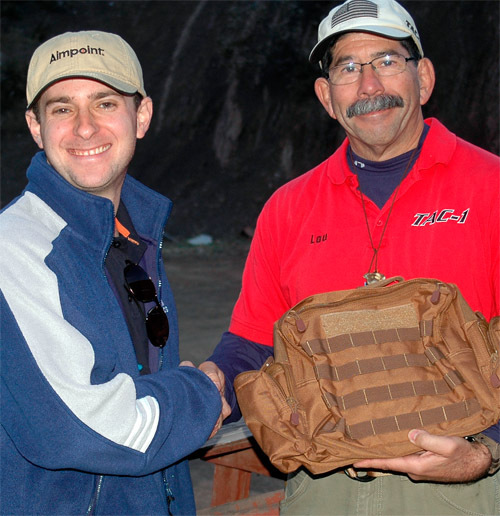 A student must score a satisfying score to receive TAC-1 Pistol Certification. TAC-1 Shooting Belt Keepers are awarded to students based upon their final score, class attendance, dedication to the art, weapon proficiency, leadership, personal character and fair understanding of various aspects of personal defense. Other weapon systems like Shotgun, Rifle, Edged Weapon and hand-to-hand combat may also be assessed for the highest level of belt achievement. White Belts are awarded to ALL students interested in pursuing a long term goal at TAC-1. Anyone wanting to obtain this belt are fully encouraged to do so at cost. However, when a student satisfactorily completes ALL modules in Pistol-I and Pistol-II, he/she's awarded with this belt at no cost. No long gun classes needed. Blue Belts are awarded to those who participated in TAC-1 Examination and Certification Course Pistol-2(D) and scored a minimum of Sharpshooter. Achieved all passing scores in P1 and P2 Module. *First belt due to promotion is complimentary. Further promotional belts must be purchased. Brown Belts are awarded to those who participated in TAC-1 Examination and Certification Course Pistol-2(D) and scored a minimum of 95% overall. Shotgun-III and Carbine-III classes with minimum score of 90%. Black Belts are awarded to those who participated in TAC-1 Examination and Certification Course Pistol-2(D) and scored a minimum of 98% or higher overall. Shotgun-III and Carbine-III classes with minimum score of 95%.